For the last couple of weeks (early January 2014) the Toronto press has been abuzz with a story emanating from York University. In brief, it is the following. A male student was taking an on-line course from Prof. Paul Grayson in York’s Department of Sociology. Although the course was on-line, Prof. Grayson required his students to visit the campus once to take part in a group activity with other students. The male student asked to be excused from this requirement as his religion prohibited his interaction with unrelated women. We don’t know the student’s religion, and Grayson refused to speculate, but he said he did consult with both Jewish and Muslim religious leaders. He then declined the student’s request. Meantime, however, Grayson’s Dean and other senior administrators instructed him to grant the request. One reason for this was that he had excused at least one other student who lived outside Canada from the requirement to be present on campus. The other reason was that, under the doctrine of “reasonable accommodation,” administrators’ are supposed to decide whether a religious accommodation would harm anyone else’s human rights. The administrators decided—somewhat reluctantly, it seems—that excusing the student from interacting with female co-students would not harm any woman students’ rights. One question here is whether the harm would be real or merely symbolic. Would the female students be harmed, perhaps, by being deprived of the male student’s brilliant insights? If there was no such harm, did the fact that he did not wish to interact with women somehow constitute a psychological or symbolic harm, suggesting that they were unworthy of his attention, or unclean, or somehow sexual temptresses. Professor Grayson argued that the York administrators would have been unlikely to assent to the student’s request if he has said his religion prohibited him from interacting with black or gay people. I think he’s right about blacks: the administrators could not permit racial discrimination, even if it had been hidden (Grayson did not have to tell other students about the request). About gay people, I am not so sure. Religious prejudices against homosexuals are rooted in some of the same prejudices held against women. Women in their bodily functions, especially menstruation, are seen by some religions as dirty and shameful. In this view, gays’ sexual activities also render them dirty and shameful. Nevertheless, I can’t imagine any York administrators instructing Grayson to grant a student’s request not to interact with gays. So why grant it with regard to women? I think the answer is the long history of separation of women and men in some religions, especially some variants of Christianity, Judaism, and Islam. This separation is bound up with traditional ideas of modesty and the separation of the sexes for their own good. So it still doesn’t seem as wrong to say that your religion doesn’t permit you to interact with strange women, as to say your religion doesn’t permit you to interact with blacks or gays. On this basis I supported prayer space for Muslim (and all other religious) students (even though space is always in short supply at Canadian universities). But I opposed shari’a based arbitration (as well as arbitration under Jewish law) on the grounds that it can undermine women’s and children’s rights. I supported gay marriage. I opposed banning of cartoons, on the grounds that freedom of speech is more important than protecting believers from offense. Using the principle that accommodation must not undermine other people’s human rights, I think Professor Grayson did the right thing. Even if there was no immediate material damage to the women in his class, the principle that a man does not have to interact with women in an educational or work setting is denigrating to them. It implies that they are less than fully human, not worthy of the same respect as men. 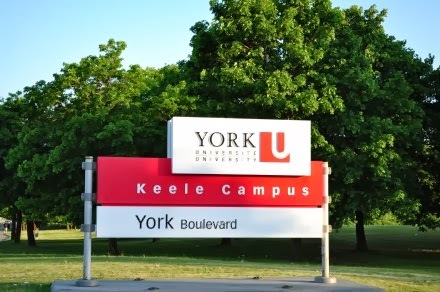 Of course the York University case gives ammunition to proponents of the Quebec Charter of Values, about which I wrote on September 11, 2013: you can find that blog here http://rhodahassmann.blogspot.ca/2013_09_01_archive.html . The proposed Charter would ban public servants from wearing religious apparel at work. I maintain my view on the Quebec Charter. I see no reason to ban religious apparel from the public sector, although I would prohibit proselytization by public servants at their workplace, whether in Quebec or elsewhere. Banning religious apparel sends an extremely negative message to members of minority religious groups, while permitting it does not undermine anyone else’s human rights.